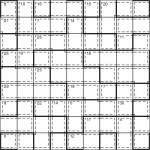 This entry was posted by Gareth Moore on March 19, 2010, and is filed under Killer Sudoku, Killer Sudoku Variants, Sudoku, Sudoku Variants, Toroidal. Follow any responses to this post through RSS 2.0. You can leave a response or trackback from your own site. I actually found this easier and preferable to your regular toroidal jigsaw sudokus. I usually find the killers easier to solve. I know what you mean – the Killers generally have far information/clues than the non-Killer puzzles, so once you get going (and that can be the difficult part!!!) they usually fall more easily. Agreed. I usually ignore the toroidal shapes until I really need them. Although I have been getting better at doing toroidal puzzles … different colour highlighter markers helps. Oh, please keep them coming. I’m relatively new to these puzzles (as in ‘beyond’ the written press) having been internetted for the first time only recently. Am tackling the large Samurai Killer Sudoku Pro 13 grids at the moment. Enlarged each quarter and sellotaped together – much better than filling a table with a wooden jigsaw!